It is not advisable to hike alone – if you do, at least inform someone of your intention and at what time they should expect your return. If possible carry a cell phone to call for assistance if needed. Emergency telephone numbers should be noted and are provided on a notice board at the start of some of the trails. Camdeboo National Park is located in a summer rainfall, semi-desert area. Summers are very hot and winters can be very cold. During the summer months, visitors are advised to confine their activities to early mornings and late afternoons. Most of the average rainfall of 336 mm per annum occurs in summer and autumn, with a peak in March. Thunderstorms and high temperatures are common during the summer months while snowfalls can occur in the high-lying areas in winter. Costs: Only conservation fees (a normal park entrance permit available at the Valley, Game Viewing Area entrance gate or the parks office in Bourke St) is required to walk this trail – R50 / person for international visitors or discounted to R20/person for South African visitors. 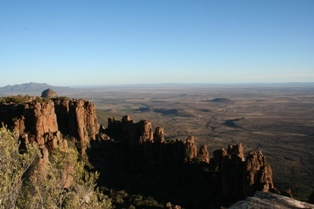 Starts at the Valley of Desolation parking area and extends for about 1.5km via the Valley viewpoints. There is an information board along the path between the parking lot and the first viewpoint which details proclamation of the Valley as a National Monument and includes a map to show the layout of trail-paths. The trail is marked with the Crag Lizard logo. The Valley of Desolation is a National Monument and the premier tourist attraction of the Camdeboo National Park. From the parking lot hikers follow a cobbled pathway to the first Valley viewpoint, where there is an information panel that interprets the geological and paleontological history of the Karoo. Black eagles are often seen at close range and the high speed manoeuvres of the alpine swift, hold many a visitor spellbound! From here hikers progress to the second viewpoint which offers a breathtaking view of piled dolerite columns against the backdrop of the plains of Camdeboo and a timeless sense of wonder at a landscape said to be the product of the volcanic and erosive forces of nature, over a period of 100 million years. After the second viewpoint there is an option for a quick return to the car park, or to continue with the trail along the rim of the cliff edge, which provides even more impressive views of the rock formations. There are numerous precipices and crevasses along this section of the trail and due care needs to be taken especially if there are children in the group. From the beacon at the extreme western edge of the cliff, the route winds back to the parking lot through moist mountain-top shrublands which abound with birdlife. Mountain reedbuck and kudu are frequently sighted by hikers along this section of the trail while cape mountain zebra are also occasionally seen. This is an easy route which does not require any particular skills and is suited to people of all ages. The trail starts from the Gideon Scheepers Memorial roughly 3km outside of Graaff-Reinet on the Murraysberg Road. The trail zigzag’s up the foot of the mountain & levels out to give one a great view of Ncqueba Dam & the surrounding area. Numerous antelope can be encountered along the route, such as Kudu & Hartebeest. Difficulty: Option 1 & 2 - For all ages. Option 3 – Fit hikers & children under supervision. Costs: Only conservation fees (a normal park entrance permit available at the Valley, Game Viewing Area entrance gate or the parks office or at the Tourism Office in Church Street) is required to walk this trail. Free with a Wildcard. This ‘pan-handle’ shaped trail starts and ends on the fringe of town (Bergendal 804m) at the Spandaukop gate. The route is clearly marked with an African hoepoe logo. There are three suggested options to walk this route, but hikers can in fact tailor-make the distance of their walk along the route. The first option is to walk to Eerstefontein (at the base of the ‘pan-handle’) and back, a distance of about five kilometres. This section of the route initially traverses some rather degraded land but this soon gives way to succulent thicket as one gains altitude towards Spandaunek at 935m. 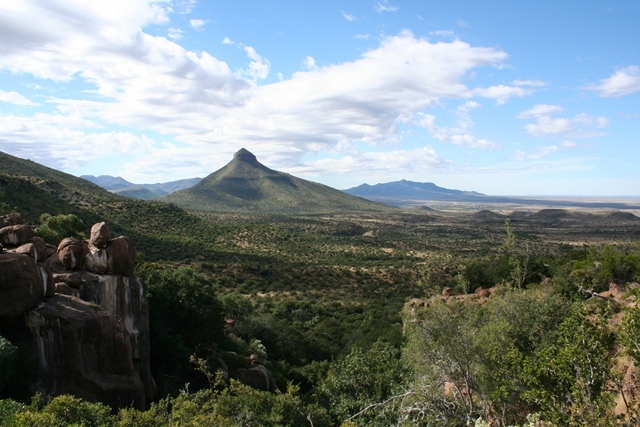 Following the route hikers experience a wide change in vegetation types and birds that are representative of both the Karoo and Eastern avifaunas make up a diverse and interesting eco-tonal mix. At Eerstefontein there are large shady trees, some benches and clean spring water that is safe to drink. The second option extends your walk to Agterstefontein and bypasses the Camdeboo Environmental Education Center. Hikers should note that this facility is for the exclusive use of booked groups only. The return distance to the start from Agterstefontein is about 11 km and hikers who move quietly are assured of numerous wildlife sightings, including Kudu, Cape mountain zebra, mountain reedbuck, springbok, baboons and perhaps a bat-eared fox among many other species. Agterstefontein is an ideal spot to stop and rest, whether you plan to return to the start or continue with the whole trail. Like Eerstefontein there are large shady trees, benches and fresh water. No fires are allowed and hikers are expected to remove the remains of their picnic – please don’t bury anything, since baboons or other carnivores will soon excavate it! Hikers who decide to do the entire full day route (a total distance of 16 km from start to end) continue with the trail climbing to the top of Akkediskrans along a twisting pathway between large dolerite boulders with many mountain plum, cabbage and shepards trees. From this point it is a fairly level walk along a doleritic terrace until dropping downhill into Wildebeeskom. From here the trail follows an old game path along the alluvial sediments of a flat-bottomed watershed which originates at Spandaunek – the base of the ‘pan-handle’. From here you are back on familiar territory and all that remains is the downhill slog back to your car and a welcome cold beer in your guest house or hotel. Difficulty: Fit hikers & children under supervision. Cost: Daily conservation levies plus R30 per person per night. Hikers are reminded that it is illegal to collect firewood within a protected area. The bags of wood in the hut are for sale at ten rand (R10-00) per bag for your convenience. The amount is payable in cash, depending on your use when you drop the keys off back at the Park office in Bourke St. This overnight trail is situated in the mountains of the Eastern section of the park. The diverse nature of the vegetation and topography in this section of the Park creates a landscape that is well suited to the interests of hikers. The Waaihoek Trail Hut may be booked for up to two consecutive nights and if you don’t have the energy to walk the trail, the hut may be reached by a high ground clearance vehicle. The route is marked with a Cape mountain zebra head logo on sign-plates at infrequent intervals, i.e. where the trail changes direction or at interim sites, to reassure you that you are on the right track. It follows the course of old fence lines or management tracks and may in places be indistinct due to infrequent use or above average rainfall. This is a strenuous route, especially during the hot summer with a 510m gain in altitude from 784m at the start to 1284m at the overnight hut. Hikers are advised to carry an adequate supply of water in summer and make sure that they have warm clothing on hand during the winter. Weather conditions may change radically overnight! This trail is not suitable for small children. You may leave your vehicle at the trailhead, about one km from the Lootsfontein entrance gate. While your vehicle may be parked within a controlled area and be screened from view there is a risk of break-in to anything which remains unattended. Do not therefore leave anything of value in your vehicle. The preferable course of action is to arrange a drop off and pickup. The distance along the marked route from the trail head to the overnight hut is about 12km. This takes the average person about 5.5 hrs to cover. You should plan your route carefully in order to avoid the hottest hours of the day or being stranded in the dark. If you are able to map read you are welcome to follow any route of your own choosing. A detailed contour map of the area is available from our office at no extra charge to assist you with your navigation. There are a number of very worthwhile shorter walks from the trailhut if you can find the time to squeeze something in. Alternatively you can book the hut for two consecutive nights and spend a day walking wherever you like as long as you do not cross any fences. You can follow the track past the water supply pump, to the top of Hanglip with its panoramic view of the Camdeboo plains or follow the stream bed below the hut down Wolfkloof to the waterfall. You can also walk a circular route by following the left hand turn off the track leading up to the hut. The rocky hill to the North East of the hut provides a stunning 360 degree ‘sundowner’ view of the landscape. Wildlife that may be seen in this section of the park includes Cape mountain zebra (an endangered species), kudu, mountain reedbuck, klipspringer and baboons. The flatter bottom-lands support populations of springbok, black wildebeest, red hartebeest and ostrich. Duiker and steenbok are also common. There are no large game animals that pose a threat to human life or property. If you have to worry about something, keep a look out for snakes on hot days or other people, pursuing illegal activities of varying description! Facilities in the hut include solar lights, three double bunk beds, four loose sleeping matt’s, a three legged pot and a braai grid. You should ensure that you have a few candles or a good torch to backup our lighting system in case it fails! No bedding is supplied – you have to take your own sleeping bag or bedroll. The trail hut is equipped with an energizer which provides a high voltage shock to anti-baboon devices on the roof capping. This is to prevent baboons damaging the roofs by pulling out the thatch. The energizer makes an annoying noise of continual clicks and may thus be switched off during the period of your occupancy of the hut. Please remember to switch it back on when you leave! Water is provided through a tap at the trail hut and in the shower. The supply tank is situated at the end of the access road about 500m to the south of the hut. You will need to open the gate valve at the bottom of the tank before water is available at the hut. Please close this valve before you leave. This is important as it insures that those who follow you will be guaranteed of a water supply, while the overflow from the tank provides water for the wildlife in the area. There is cell phone reception at a number of sites along the route including the overnight hut. It is therefore advisable to make use of this technology if you are equipped, in the event of circumstances that require rescue. In such a case the following numbers may be of some help: Park Manager 082 901 3373; Reserve office (Mon – Fri / office hours) (049) 8923453; Emergency Services. Please do not bury any rubbish in the Park. If you do some wild animal is sure to dig it up! We expect you to observe the rule that what you carry in you will carry out ie. Take only pictures – leave only footprints. Cost: Donation @ Homestead of the farm Compassbergt. The trail starts from the farm, adequately named, Compassberg, owned currently by the Sheards. Contacting them beforehand is advisable, Brenda’s number is 049-842 2420. To reach the start of the hike, travel along the dirt road from Nieu-Bethesda, for approximately 30km. Once reaching the farm, head towards the mountain & park your vehicle at the second gate. Follow the farm road till you reach a reservoir, enter through a small gate & head towards the mountain. The initial climb is very steep, but in grasslands. You zigzag up the mountain, reaching numerous little plains before once again heading up. ¾ of the way up the boulders start, be very weary of your footing. Do take along warm clothes, since the temperature drops dramatically. You climb from roughly 1700m to 2505m. Along the way you’ll find rheebuck, steenbuck, kudu, klipspringer & a high probability of seeing the black eagles. No water is available, do take an adequate supply. Weather conditions change rapidly, caution for windy conditions. With regards to all walking trails - Remember – leave only footprints, please remember to remove all litter.